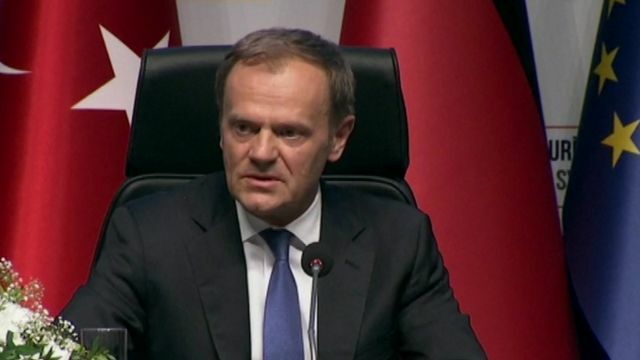 Turkey 'best example' of treating refugees Jump to media player EU Council President Donald Tusk has told a conference in Gaziantep that Turkey is the "best example in the world of how to treat refugees". Merkel in Turkey to boost migrant deal Jump to media player German Chancellor Angela Merkel and European Union officials are to visit a camp for Syrian refugees in Turkey. The president versus the satirist Jump to media player The BBC's Mark Lowen in Turkey and Damien McGuinness in Germany assess the row over a German TV comic who has come under fire for reciting an obscene poem about Turkish President Recep Tayyip Erdogan. Migrants' plight as Pope visits Lesbos Jump to media player The Pope is visiting the Greek island of Lesbos to show support for refugees trying to reach Europe. EU Council President Donald Tusk has told a conference in Gaziantep that Turkey is the "best example in the world of how to treat refugees". Speaking during a visit that seeks to bolster a controversial EU-Turkey deal, Mr Tusk also said "no-one has the right to lecture Turkey on what they should do."